A family owned and operated New Hampshire fireworks store, Stateline Fireworks carries one of the largest selections of New Hampshire consumer fireworks at unbeatable low prices. Stateline Fireworks of Winchester, New Hampshire sells fireworks with no phony gimmicks or gags like the "Buy one get one free deals". Do you really think you are getting the second item free? Fireworks buying is pure and simple at our store, with no pressures or hassles. You can buy one piece or as many pieces as you like with no hidden marketing gimmicks...Just quality brand name consumer fireworks at the lowest rock bottom prices around! Experienced sales staff is on hand to help you with your purchase. We also have a video station for your viewing, helping you to determine what firework item is proper and safe for your family's backyard fireworks display. Also at Stateline Fireworks, visit our fireworks museum showcase that has samples of consumer fireworks manufactured from as far back as 1935. Stateline Fireworks is located in Southwest New Hampshire on Rt. 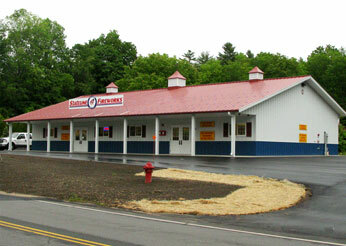 10 (151 Keene Rd.) in Winchester, NH. Just over the Massachusetts / NH State line. It's an easy one hour ride North of Springfield, Massachusetts or 20 minutes East of Brattleboro, Vermont.